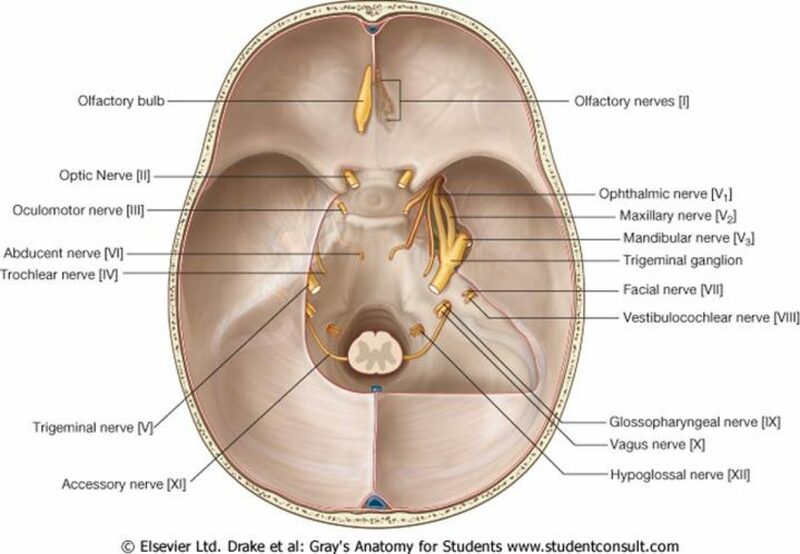 The anatomy of the trigeminal nerve is complex. It consists of both motor and sensory components. Medulla:Spinal Nucleus. Receives fibres conveying pain and temperature. These fibres than join the fibres with the spinothalamic tract from the lower limb. This is important because in a lateral medullary syndrome patients can have ipsilateral loss of pain and temperature and contra-lateral loss of arm/leg of pain and temperature because the fibres have already decussated at the level of the spinal cord. The motor and sensory nerve roots emerge from the lateral brainstem. The Gasserian Ganglion lies on the apex of the petrous part of the temporal bone. Here the three divisions of the trigeminal nerve merge. Each passes through its own foramen and carries innervation from a specific area of the face. If there is any question you will be asked about it will be regarding trigeminal neuralgia. I was asked about this in medical finals. It is important because it can cause severe pain and some patients have even committed suicide secondary to the pain. Patients with unilateral severe facial pain often occurring the 2nd and 3rd branches of the trigeminal nerve. This pain is often triggered by speaking, shaving and brushing his teeth. It commonly affects women and >50 years old.